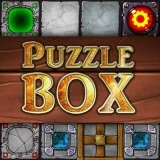 In this game you will sink into the mystical world of puzzles. Here you have to move the boxes and put them in correct place. Use different portals and other boxes. We know that you will do it. Enjoy the game.